Capt. Gary Peloquin welcomes you to an awesome Calcasieu Lake; The best light tackle fishing in Louisiana for Speckled Trout, Red fish and Flounder. With over 25 years experience as Calcasieu Lake Fishing Guides, our goal on every trip is 100% customer satisfaction. At Hackberry Guide Service we know Calcasieu Lake Charter Fishing, our goal is for you to enjoy the best fishing trip you have ever experienced on Calcasieu Lake. We offer 100% customer satisfaction, with our fishing guide taking you to the best fishing grounds in the region for flounder, speckled trout, and red fish. Our captain and experienced fishing guide welcomes you aboard for the fishing trip of a lifetime. 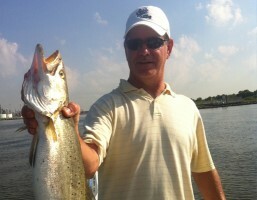 Hackberry Guide Service takes you to the best fishing grounds for speckled trout, flounder, and red fish. We provide the fish cleaning, cold drinks, and artificial bait. Live shrimp is not included. Our fishing guide has twenty five years of experience in the area and is Coast Guard trained for your safety and peace of mind. Call Hackberry Guide Service in Lake Charles, LA at 337-302-1977 today to book your full or half day charter with our fishing guide and to learn more about the services we provide. Book your trip today and call Captain Gary at (337) 302-1977. Children are welcomed and encouraged to fish. For decades, anglers from Texas as well as other Gulf Coast states have flocked to Lake Calcasieu, just outside Lake Charles, Louisiana, to sample its legendary fishing. Located a scant 2 1/2 hours from downtown Houston, Lake Calcasieu is close enough to be convenient, yet far enough to be 'exotic' for fishermen from the Lone Star State. Most often, Texas fishermen take their initial trip to Big Lake to "do something different." But, after that first foray, they are hooked and become regular Lake Cal fishermen.